Safety, comfort and style at a great price with these 5 pair bulk packs from our friends at UV Wraps - affordable AS/NZS1337.1 eye protection in a lightweight polycarbonate frame ideal for at work, in the shed or around the yard. These 5 pair bulk packs are the perfect answer to affordable eye protection, whether you need a few pairs for yourself or a cost-effective solution to hand out to your crew on site. 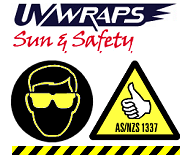 Please contact us for pricing if you larger quantities of UV Wraps safety glasses. This bulk pack contains 5 pairs of UV Wraps smoke tinted non-polarised foam-backed safety sunglasses. Gloss black polycarbonate with soft rubber adjustable nose piece and arm tips. This bulk pack contains 5 pairs of UV Wraps foam-backed clear safety glasses. This bulk pack contains 5 pairs of UV Wraps Winks smoke tinted non-polarised foam-backed safety sunglasses. Gloss black polycarbonate with grey soft rubber nose piece and arm tips. 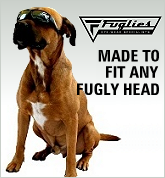 This bulk pack contains 5 pairs of UV Wraps Winks copper tinted non-polarised foam-backed safety sunglasses. Gloss dark grey polycarbonate with orange soft rubber nose piece and arm tips. As worn by Australia's military elite. specifications for the Australian SAS.